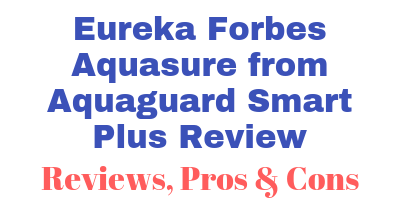 If you are looking for Eureka Forbes Aquasure from Aquaguard Smart Plus review then I must say you are at the right place. Eureka Forbes aquasure from aquaguard smart plus has a very compact design and modern look. This is a wall mountable water purifier and you can also use it as table top but wall mounting is more convenient. It comes with RO + UV + mtds water purification technology. This water purifier can purify water from both sources i.e. municipal water supply and bore well water. It also have some other additional features like voltage fluctuation guard which protects the water purifier during voltage fluctuation. As mentioned above Eureka Forbes Aquasure from Aquaguard Smart Plus comes in very compact design so it will not take much of your space, which makes it ideal for small-medium sized kitchen. At the front, this water purifier have different indicators such as purification process indicator, full tank indicator, low pressure indicator, error indicator and water level indicator. It comes with normal water dispensing tap. Overall the design of this water purifier is pretty simple. Aquaguard Smart Plus comes with RO + UV + mtds water purification technology. It completes its water purification in 6 stages. The first stage of water purification is consist of clarity cartridge which is also known as i-filter. This filter removes physical or visible impurities from the water like sand, mud, dust etc. The second stage of water purification is consist of chemi block. The chemi block also have built in particle trap filter. This filter removes bad taste and odour causing contaminants from the water. It also remove excess chlorine as well as harmful pesticides from the water. Usually water from municipal water supply is treated with chlorine for purification which leads to forming harmful chlorine by-products in the water and this filter basically removes such contaminants from the water, which makes it ideal even for purification of municipal water. 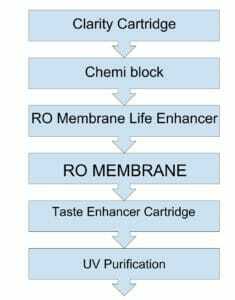 The third stage of water purification is RO membrane life enhancer. This stage of water purification basically works as a protective layer for a RO membrane, as RO membranes are very expensive. This water purification stage basically prevent scaling of dissolve calcium and magnesium. The Fourth stage of water purification is of RO filtration. The stage is consist of RO membrane. The water is passed with a great fall through this membrane which allows water molecules only to pass through it and blocks all the other harmful dissolved salts and solids from the water. The fifth stage of water purification is of taste enhancer cartridge. This purification stage contains carbon granules which remove organic impurities as well as remaining bad taste and odour causing impurities which helps to improve the taste of the water. The 6th stage of water purification is of UV disinfection chamber. The stages consists of UV bulb. at this stage the water is exposed to the UV rays of the UV bulb which inactivates harmful bacteria, viruses and protozoa was from the water making the water 100% microbe free. This water purifier comes with mtds technology. This technology allows you to adjust the TDS of the water manually. At the time of installation the expert who will come to install this water purifier will have the essential tools like TDS metre to check the TDS of your water and will adjust the TDS of water purifier accordingly. It basically helps to retain the essential natural minerals in the water which basically makes the water healthy and tasty. Additionally This water purifier also comes with a Pre-filter which helps to remove physical or visible in creative from the water like sand, mud and dust. It also helps to improve the life of other filters. With 6 stage water purification and an additional pre-filter with mtds technology Aquaguard Smart Plus is a very solid water purification solution. Aquaguard Smart Plus is equipped with 6 litre water storage tank. The water storage tank is covered with an outer body which prevents the invasion of insects or dust particles in the water storage tank. Water purification process indicator– As the name suggests this indicator will notify you when the water purification process is going on in the water purifier. Full tank indicator– It will notify you whenever the water storage tank will get fully filled. This is an automatic water purifier so you don’t have to manually switch off the water purifier. It will automatically turn off the water purification process once the water storage tank is fully filled and it will automatically restart the water purification process once the water level decreases. Low water pressure– As this is RO water purifier it requires a good water pressure for proper working. It comes with an inbuilt water pump to boost the water pressure and it will work properly with additional pressure of normal overhead water tank but if it get lower water pressure then it will notify you with this indicator. No water supply– This indicator will notify you whenever the water purifier will not get water supply. Error indicator– This water purifier will automatically detect if there is any error in the machine or filter and we’ll notify you about it with this indicator so you can arrange its service. Water level indicator– This water purifier also comes with a water level indicator at the front which is not very clear. This water purifier does not comes cartridge life indicator which is the nice feature to have. Overall Aquaguard Smart Plus comes with a good set of indicators which are very helpful. Energy saving mode– This water purifier comes with a smart energy saving mode which will automatically shut off the water purifier once the water storage tank is fully filled. So it will help to cut down some of your electricity expenses. Smart performance during voltage fluctuations– This feature basically protects the water purifier during voltage fluctuations ensuring its long life. Overall the users are very happy with its impact design and decent, simple looks. They are also happy with the purification of this water purifier. As the water level indicator of this water purifier is unclear some user found it inconvenient. If you are looking for a compact water purifier with a good water purification technology then Aquaguard Smart Plus is ideal for you. This water purifier also have a good set of indicators which are very helpful but it doesn’t come with cartridge is life indicator which is a good to have feature in a water purifiers. Also the water level indicator of this water purifier is very unclear which is very inconvenient. Overall Aquasure plus comes with a lot of features with a very reasonable price tag so it is definitely value for money product. Q. Does this water purifier comes with pre filter? A. Yes, this water purifier comes with a pre filter which will be fitted outside the water purifier. Q. What is its water storage tank made up of? A. The water storage tank of this water purifier is made of food grade plastic which is non-toxic and durable as well. A. No. This is an automatic water purifier and it will automatically shutdown the water purification process once the water storage tank is fully filled and it will automatically start the water purification once the water level decreases. Q. Does this water purifier cools or warms the water? A. No, this water purifier does not cools or warms the water, it just purifies the water water. Q. Does this water purifier require pump booster? A. This water purifier comes with an inbuilt pump booster which will be enough to create water pressure with addition to the pressure of a normal overhead tank for its proper working. But if the water pressure at your house is very low then you may require to attach a separate pump booster. Q. How many total filters are present in this water purifier? Additionally this water purifier also comes with a pre filter.